Norman Rockwell at Famous Artists School. Norman Rockwell Museum Digital Collections. Courtesy of Cortina Learning International/Famous Artists School. ©Norman Rockwell Family Agency. All rights reserved. Founded in 1948 by illustrator, Albert Dorne, the Famous Artists School (FAS) became America’s most popular art correspondence course during the mid-twentieth century, with help from some highly acclaimed faculty members. 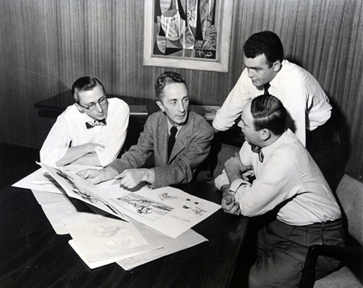 Courses by twelve giants in the field of illustration, including our own Norman Rockwell, made a wealth of knowledge about the art of picturemaking available for the first time. 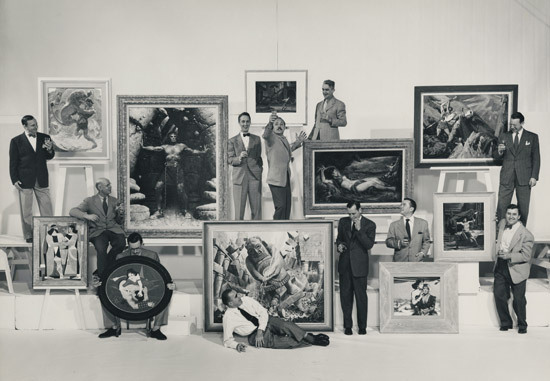 Fortunately, many artworks created for publication in FAS courses remain largely intact because of the stewardship of Famous Artists School/Cortina Learning International owners, Magdalen and Robert Livesey, who have generously promised the Famous Artists School Archive to Norman Rockwell Museum. Our gifted and dedicated intern, Ryan Mitten, a recent graduate of SUNY New Paltz, has spent countless hours immersed in the FAS collection to establish an inventory of the treasures contained within. We are most grateful to Magdalen and Robert Livesey for their generosity and support, and to Ryan Mitten for his incredible work in documenting this important illustration-based collection. Please enjoy Ryan’s essay which follows. It is always exciting when new facts about beloved artists are discovered. 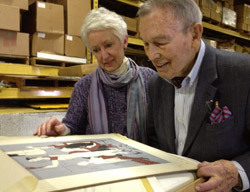 Norman Rockwell Museum will be receiving a donation of the Famous Artist’s School’s magnificent archive, which offers a unique glimpse into the inner workings of mid-twentieth century illustration. The archive is a treasure-trove; with one-of-a-kind gems waiting to be found in every drawer. We now have a new perspective into the interactions between Norman Rockwell and his contemporaries. A series of original Rockwell process sketches done for the Famous Artist’s School course book was discovered in a pile of copies set to go to the dumpster. Imagine the feeling of amazement to find images so rich in history, passion, and wisdom. These Rockwell sketches were very close to winding up in a garbage dump rather than a museum. This collection has been sitting in damp and dusty conditions since the Nixon administration. Luckily, most of the materials were pulled out in time before falling victim to water damage and deterioration. Norman Rockwell Museum is thrilled to acquire this massive collection, and incorporate it into its world-renowned illustration archive. The materials are being digitized so that they will be accessible to future generations of scholars and art lovers. Thankfully, the owners of this archive didn’t throw anything away. There are over 400 flat-file drawers in the warehouse, and it is imperative to investigate every folder because there is original art hiding all throughout. The Famous Artist’s School was the brainchild of Albert Dorne (1904-1965). Dorne was a wonderfully gifted illustrator who worked his way out of poverty by developing an unprecedented system of teaching art school through the mail. Dorne exuded a machismo stature with the leftover muscles from his boxing days. His appearance was distinguished by his inseparable cigar and dark bushy eyebrows, which looked like two fat caterpillars sleeping above his eyes. Not unlike Rockwell, Dorne was skilled at rendering astonishingly lifelike gestures and facial expressions. A portrait of Dorne by Norman Rockwell is one of the great surprises from the archive because it had never been documented until now. The Famous Artist’s School students were equipped with a tool-belt of different styles and techniques. Al Dorne assembled a powerhouse faculty comprised of top illustrators from a wide variety of genres. 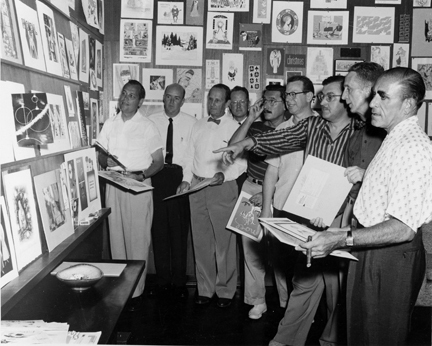 The founding members were: Al Parker and Jon Whitcomb, the eminently popular and influential romance illustrators. If students were passionate about automobiles, they turned to Peter Helck, the master of drawing trucks cruising through the rural farmlands of America. Students also studied John Atherton’s renowned countryside paintings and realistic tableaus of everyday household objects. To paint magnificent mountains and cityscapes, students studied the masterful watercolors of Dong Kingman. To become proficient in graphic design, budding artists learned the tricks of the trade from George Giusti, an illustrator famous for his bold and colorful cover designs for Fortune magazine. Students learned from the visceral paintings of Ben Stahl, one of the most popular Saturday Evening Post illustrators. Rockwell once wrote a letter extolling Stahl’s skill: “We are but illustrators, but Ben Stahl is among the masters, and I am full of admiration” (NY Times). For aspiring artists working to sharpen their ability to draw the human figure, Robert Fawcett and Austin Briggs provided valuable tutorials. To create realistic depictions, students studied the draftsmanship of Stevan Dohanos and Norman Rockwell. Those enthralled with the Wild West learned how to draw horses and corrals from Fred Ludekens and Harold Von Schmidt. In addition to the founding members, many other renowned illustrators became part of the Famous Artist’s School faculty. The comic art department was led by Bud Sagendorf, who illustrated Popeye the Sailor Man. Students learned from the whimsical ingenuity of Rube Goldberg, and from the lively cartoons of Willard Mullin, the comic artist best known for his beloved Brooklyn Bum. The artists’ letters reveal an intriguing sense of these elite illustrators. The letters show not only business correspondence, but also the friendship and admiration that these illustrators had for one another. Plus, the files contain fascinating lecture notes used by the great illustrators to teach the Famous Artist’s School instructors. The Famous Artist’s School led by Al Dorne was a center for developing artistic talent. A key selling point for the Famous Artist’s School was that students could work at their own pace, and from the comfort of their own homes. Corresponding through the mail made it convenient for aspiring artists and hobbyists to sharpen their skills, regardless of their geographic proximity to the school. When the painting and illustration courses proved to be successful; the writing, cartooning and photography schools were soon to follow. The one word summary of the Famous Artist’s School archive is: process. That is, showing how the artwork is done. 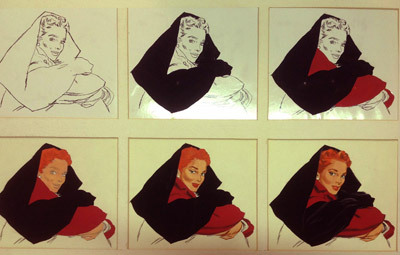 Examples of process are depicted in the rough sketches in which the artists show the step-by-step development of a painting from start to finish. Much of the Famous Artist’s School coursework shows the use of preliminary sketches to teach what the artists believe to be the significant building blocks beneath great artwork. Process is the underlying mainframe of the art. Have you ever found yourself confused in a museum, asking “how did the artist do that?” or “what was the artist thinking?” A great way to unfurrow your brow is to study explanations from the artists themselves. Each artist has a featured lesson in which they lay out a stream of consciousness walkthrough using both words and images to show how they go about structuring a work of art. The artists’ walkthroughs provide thoughts on: arranging the light source and composition; achieving desired effects with different pens and brushes, and showing varied ways to mix paint in order to render certain colors and values. These comprehensive guides are filled with insightful advice and interpretations from renowned illustrators. What could be better for an up-and-coming artist than tricks and techniques from the great masters themselves? The archive contains a vast collection of photographs from the school’s heyday. What makes these photos significant? These newfound candid photographs of the famous artists are important for multiple reasons. There are a limited number of photos of any person. Now that these photos have finally reached the light of day after half a century of being out of public view; we have a wonderful opportunity to revisit history. These informal photos are significant because they reveal a more relaxed and natural side of these artists as opposed to formal portrait photography. These snapshots allow us to feel a sense of the people behind the signatures. Due to their work, illustrators spend much of their time as hermits. We now have a rare chance to look back in time and see iconic illustrators casually interacting. 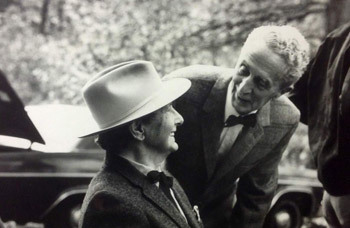 The archive contains numerous delightful photos of Norman Rockwell’s genuine body language and smile. We can now see these great illustrators sharing knowledge and enjoying one another’s company. These photographs offer the privilege to peer in and observe the meeting of great minds. The pictures are also significant because these illustrators were revered as celebrities. The first half of the twentieth century was a time when an illustrator could gain notoriety and become a household name. In addition to being familiar with the art, American citizens also recognized Jon Whitcomb’s dashing smile, and Norman Rockwell’s long friendly face with the pipe drooping down towards his bow tie. It is no accident that Al Dorne’s unmistakable face was featured on the Famous Artist’s School advertisements. Both the artists and their artwork were recognizable. This rich collection of photographs reveals the style and charisma of the famous artists as they are literally rubbing shoulders. The photographs also reveal how the artists worked and what tools they used. For example, seeing Rockwell use a projected photograph on his drawing paper in preparation for a painting is a rare chance to see the master at work. The Norman Rockwell Museum archive will digitize these photographs so they can be accessed and enjoyed for generations to come, as we do with photos of any loved one. In a way, Rockwell and his work have always belonged to all of us. The Famous Artist’s School archive at Norman Rockwell Museum will offer an awe-inspiring view into the heartbeat and imagination of some of the twentieth century’s most talented and influential American illustrators. The archive is rich with insight into the minds of artists who created beloved images seen on countless newsstands across the nation. Norman Rockwell is the master of showing the wonderful subtleties of human interactions, and now we have a new perspective on Rockwell’s own relationships.